For small-to-medium-sized businesses in Puerto Rico, the Caribbean and some areas of Central America, the holidays are a busy time of year. End-of-year sales opportunities – especially those prior to Christmas, Chanukah and Three Kings Day – require store managers to increase inventory, as well as office supplies, to keep the cash register ringing. From seasonal wrapping paper and food products, to the hottest toys and games, buying retail goods and getting them on shelves requires additional planning and logistics. For busy businesses, Crowley’s speed to market is their competitive advantage. With 1-3 day transit times to several important markets in the Caribbean Basin, including Puerto Rico and Central America, Crowley provides fast, convenient supply chain services so retailers can replenish fast-moving holiday inventory and maximize seasonal sales. These services ensure businesses have what they need, when and where they need it, and in the right quantities. Read on for more details about how Crowley empowers businesses to succeed during the holidays with seamless shipping solutions. It’s key for retailers to keep their shelves stocked and ready for an influx of buyers around these dates. Because Crowley offers LCL and barrel shipping options that deliver cargo directly to your store, there’s no need to stockpile massive quantities of goods and supplies. Our LCL and barrel shipping options allow businesses to replenish stock on an as-needed basis, eliminating the need for local storage. For businesses that do order larger quantities of certain goods, but need more storage space, Crowley offers high-security warehousing and distribution, as well as inventory management services. Entrusting Crowley with your inventory gives peace of mind that it is safe, secure and available exactly when you need it. Shopping online for in-demand retail items and office supplies is a convenient way to keep shelves stocked and businesses running. But, surprising to some, many online sellers do not offer international shipping options. Business owners traveling to South Fla. to purchase items should know that Crowley recently opened a new, walk-up Pack and Ship center in Doral, Fla., near Miami. This convenient shipping center is staffed with service-oriented team members who will clearly guide business owners through the packing, preparation of export documentation and shipping steps. Crowley can also arrange for local pick-up of cargo in the Miami area for delivery to the retail center. To learn more about this Pack and Ship center. For business owners shopping throughout the Caribbean Basin, including Central America, Crowley provides easy shipping options. To learn the details, connect with a member of our customer care team here. Return shipments are no problem for business located in Puerto Rico. If customers return gifts that a business owner needs to send back to the manufacturer, or too much of a certain product was ordered, know that Crowley’s logistics team on the island can assist. To take advantage of this reverse shipping service, connect with a member of our customer care team here. 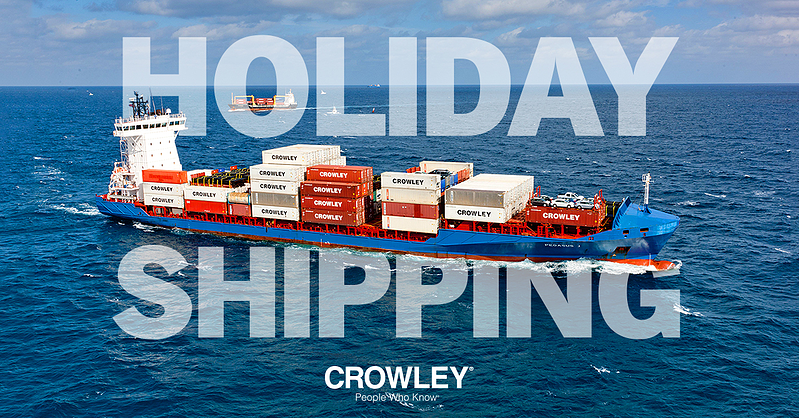 To take advantage of all Crowley’s seasonal shipping options, shoppers should view our logistics options, locations served, sailing schedules, get a quote and contact the company’s customer care team.